In 1950 Bradbury Thompson invented an alphabet called Alphabet 26. This new proposal would have simplified the alphabet by having the lower and upper case symbols identical except for size. The conventional alphabet has 19 letters that have different upper and lower case symbols(A,B,D,E,F,G,H,I,J,K,L,M,N,P,Q,R,T,U,Y and a,b,d,e,f,g,h,i,j,k,l,m,n,p,q,r,t,u,y) and 7 letters (C,O,S,V,W,X,Z, and c,o,s,v,w,x,z) that have identical symbols. The theory Thompson presented was that it was misleading for a letter, or for any graphical symbol, to have two different designs, and that these different designs were confusing school children as they learned the English language. I personal think this would be a great idea not only for learning but also for standards. I, when I’m writing to myself or sometimes to others, write in all caps, I think it developed when I was in the 4th grade after I was hit by a car and I guess it stuck. In case you have still no idea what this event is, I’ll give your the brief history. 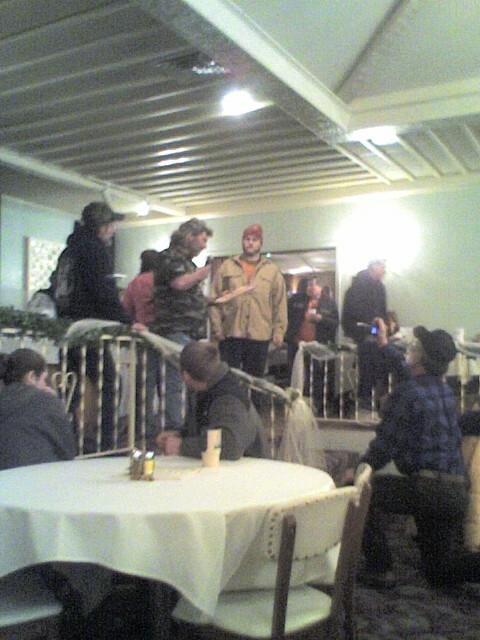 The Ridgway Chainsaw Carvers Rendezvous started as a gathering of six chainsaw carvers. 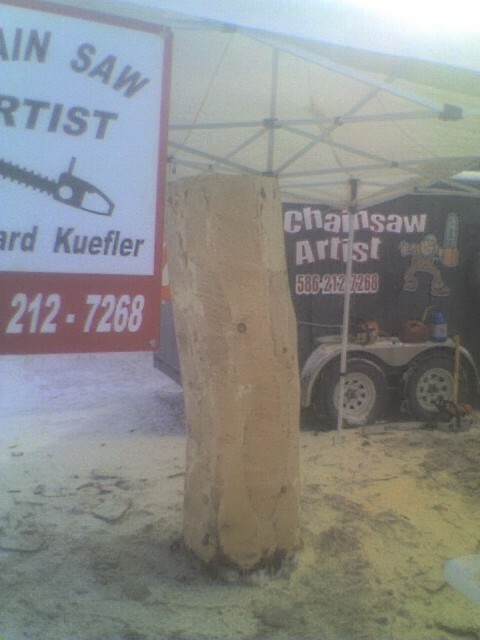 Since then, the event has grown to be the world’s largest chainsaw carving event. It is an open invitation to all Chainsaw Carvers. The event is an opportunity for all types of chainsaw carvers to share, market, learn, and teach. For carvers who tend to be leaned away from compositions, this is a great place to go to, as is not a competition but merely a gathering. The Ridgway Rendezvous is a great event, I know every time I go I learn something new. If you’re a carver I suggest you go. I’ve gone there for four years. 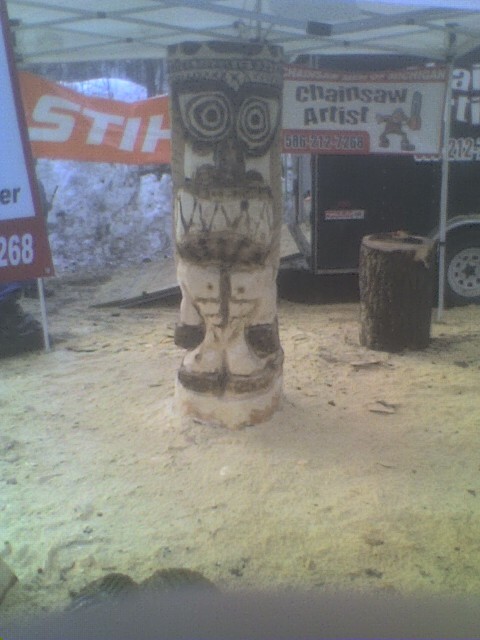 My first year, when I was a freshman at Notre Dame High School, I sold my first carving, a Tiki god, Having started carving a month or so before. I can say that much of my style of carving now was greatly influenced by what I have seen at Ridgway. Having said all that i would like to thank all those who put the event together particularly the Boni’s and also the whole town of Ridgway who comes and takes part of the event. Folding@home has been or will be implemented to help studies involving Alzheimer’s Disease, Cancer, Huntington’s Disease, Osteogenesis Imperfecta, Parkinson’s Disease, Ribosome & antibiotics. You can help buy simply installing Folding@Home on your computer. Folding@Home is a distributed computing project, meaning people across the globe are connecting their computers to fold virtual protein quicker than any supercomputer in the world could do. Also for those who own a Sony Grill PS3, Folding@Home will be accessible within the Network menu of the XrossMediaBar. Now all the unused computing power can join the cause; maybe you can feel better now that you’re gaming machine you bought for $600 can now use it’s spare horsepower by going to help someone other than yourself. What your reading now is the third attempt at a post about this subject. The second post contained to much information and was not clear enough. The first attempt was a little less than 2204 words long, I ranted to the point were most sentence were uncomprehensible and contained numerous threats to the UN. Anyways here is a much cleaner and trimmed down version of the second post. As you may know 2 days ago Daylight Savings Time started, I hate the concept of Daylight Savings Time. It just seems to say that we are lazy. Benjamin Franklin first introduced his concept of daylight savings in a letter urging those in France, specifically Paris, to save their money by getting up earlier to burn fewer candles. This idea is simple it is a quite good idea for civilization. Benjamin Franklin however, never mentioned the idea of setting clocks to adjust the standards of time. Now this is where things get “lazy”. William Willett was the first domino in this wave of laziness. He was a golfer and wanted more time to get his rounds in. William published The Waste of Daylight where he said clocks should be, at one point, advanced 80 minutes. He suggested every Sunday in April the clocks should be pushed forward 20 minutes and vice versa for Sundays in September. Before World War One no governments saw a need to actual set back their clocks. Argument’s for DST were made in parliament and shot down several years in a row. The first governmental enactment of Daylight savings time was in Germany to save coal usage, during World War One, followed by the UK. See in this case rather than relying on the discipline of solders to just get up earlier, the government chose to trick the solders, in some sense, by forcing them to adjust their clocks; Eventual the concept was adopted by many governments for the same reason, including the US. In 2006, daylight time began on April 2 and ends on October 29. This year, With the changes that congress made, daylight savings time began on March 11 and ends on November 4. This caused programs that were set to automatically handle DST hours be, for a lack of better words, “confused”. Microsoft says they can update there programs and Operating systems. “We’re aware of the upcoming change, and will make sure that Windows handles the transition smoothly,” ~Peter Houston. This change caused me to have to change some of my settings on my server, and I’m sure many people had problems. If congress reverses this action, which the article says they’re allowed to do, it will mean the same type of problems. Wouldn’t it make more sense to just wake up earlier on Standard Time than to do otherwise. Daylight Savings Time causes too many problems like birth certificate issues, offset Sundials, and problems with programs, operating systems, and servers. Anyways the concept of Day Light Savings Time is a cheat, it is jet lag on the ground, it is a governmental trick on the masses. Lets stop this social law that’s in place. Why follow a system that was a direct result of some lazy golfer who just wanted a few extra swings. Before I came to the event, I thought the money was going to the Make A Wish Foundation, but I found out after, I carved and turned in my piece, that was not the case. I was a little mad, but I found out that the make a wish foundation was complaining about the way the event saw ran so the people who ran the event decided to find another charity. So now I’m not mad, as long as it’s going to a good cause. So anyways the entire event and was dedicated in Honore of Bill Plant, a carver who died in the past year. He was given a “lifetime achievement award”, his grandson accepted the award. Every year now a new carver will be given this award, in dedication to him. My dad made 2 blue Chickens herons for his donation. After that he made a fisherman and two eagles chickens. Emil, my dad’s partner, caved two chickens owls, the first one he carved was intended to go as the piece for his donation, but before he finished it someone bought it off of him, so he made another one and submitted that one as his donation. After that he made banana split bench for a local ice-cream shop, called Two Scoops; a year early he had caved an ice-cream cone for the shop. 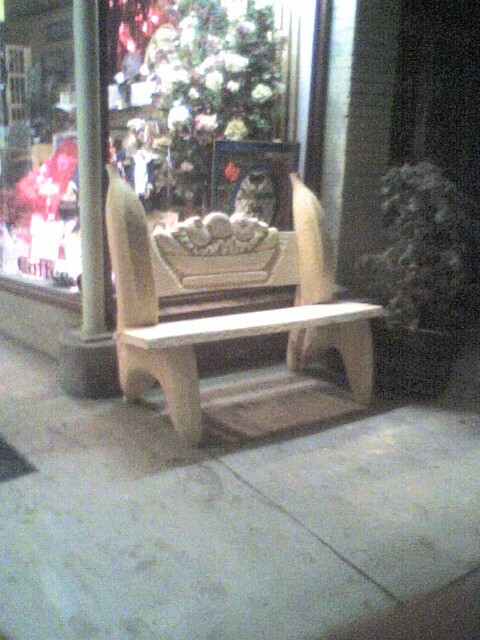 The two cavings now sit in front of the shop. I caved a Tiki, spending 2-6 hours a day, for about for days and made some minor burning changes the day before the auction. After that I carved 4 pine trees, 3 really quick and simple pigs bears, and a log cabin. You are currently browsing the rlk89.com Blog blog archives for March, 2007.